Another doodle done during the tedium of work. 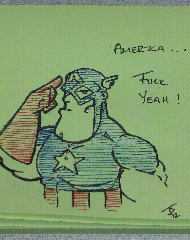 Doodle the 2nd comes from just before Avengers came out. Jason was shootin' out ideas for my daily in-between calls down time and for some reason or another, Team America came to mind. So, a great Cap mash-up combining ideas from Ultimates with Team America.